Starring: Bruce Willis, Jai Courtney, Sebastian Koch, Mary Elizabeth Winstead, Yuliya Snigir, Radivoje Bukvik, Cole Hauser, Amaury Nolasco, and more. 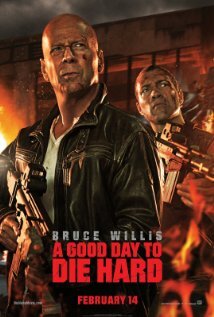 1) Acting - Total Thumbs Up: Bruce Willis is as fun as ever in his latest incarnation as John McClane. Jai Courtney was quite convincing as John's estranged son, especially when he slowly realizes he's more like his father than he ever thought. The two actors shared some great father and son 'not going to share our feelings' moments. Sevastian Koch was full of all sorts of surprises in the film. 2) Special Effects - Total Thumbs Up: Bullets and explosions filled the screen almost constantly. The film will definitely fill everyone's mass destruction quota. That being said, the spots were CGI was used to enhance or pull off some of the scenes involving the two McClanes were somewhat obvious. 3) Story - Thumbs Up: Though the previews held a few hints, the film started in such a way as to mislead viewers on what was happening at the beginning. Like McClane, we start noticing that things aren't exactly as we've been led to believe. The father and son problem story line was predictable, but with some of the other surprises in store, it mattered little. The biggest nitpick for me was the fact that for a straight twenty minutes John seems incapable of saying anything by the "J" word. Then later his son picks it up. A little more imagination would have gone a long way with regards to the dialogue here. It also felt a little forced that as a cop, John wasn't at all concerned about causing collateral damage, foreign country or not. 4) Stunts - Total Thumbs Up: The many stuntmen and women in this film should definitely receive a ton of accolades. I don't think I've ever seen such mayhem and destruction as in the long car chase scene close to the film's beginning. If there weren't actual injuries incurred during the whole 'gag', I'd be very surprised. 5) Locations/Cinematography - Total Thumbs Up: Filmed mostly in Budapest, Hungary, the film possessed a great foreign flavor. The amount of trouble the cinematographer went to to take sweeping shots of the courthouse area, the closed restaurant floor, and other locations right before they were totally destroyed by soon to occur events was almost humorous. Each sweep was like a giant hint that things were about to get messy. Conclusion: "A Good Day to Die Hard" is a wild ride with almost constant action. There is so much action, in fact, it might leave you a little numb. A couple of mostly unexpected surprises helped take away 'the sting' of the predictable plot. The male bonding between father and son and their continuous attempts not to talk about their feelings were very amusing. Die Hard 5 - Watchable if you like action flicks..And if not and want to spend your money wisely then go watch Kai Po Che.. I've not heard of Kai Po Che. Is there a link to a preview? What is it about? Aha! Found info on my own - http://en.wikipedia.org/wiki/Kai_Po_Che! Looks interesting.